There was no sewing this weekend instead I had a wonderful weekend with my sons in Adelaide. My eldest son is based in Adelaide so we decided to visit. It was a very special weekend. It is rare with adult children to have them to yourself without partners etc, so I cherished every moment. I knew it would probably be unlikely to happen again. 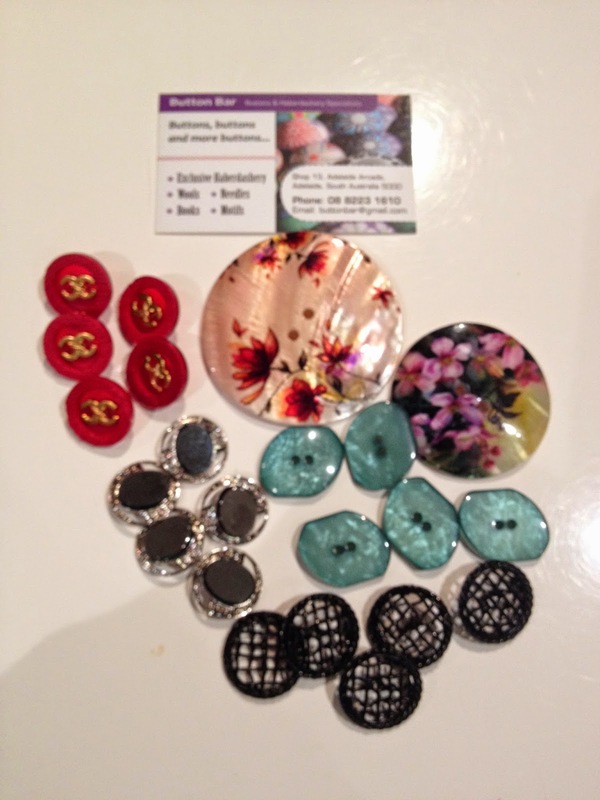 No sewing but I did go to the Button Bar in Adelaide and bought some beautiful buttons. This shop is amazing so many beautiful buttons. If you are ever in Adelaide it is certainly worth a visit. The shop is in Adelaide Arcade off Rundle Mall. I could have bought thousands of buttons, I love buttons, but I resisted and just bought these. The 2 large buttons are mother of pearl and are absolutely gorgeous. The green /blue buttons are destined for a jacket and the others I'm not quite sure about but they will definitely be needed somewhere. Although I think the word need should probably be replaced. My sons did say what do you need those for, and my response is, "there is nothing about need only want," as with most of my fabric choices. The needs of a sewing addict !